The 2013 Assembly Election for the state of Mizoram will be held on December 25 and the results will be declared on December 9. 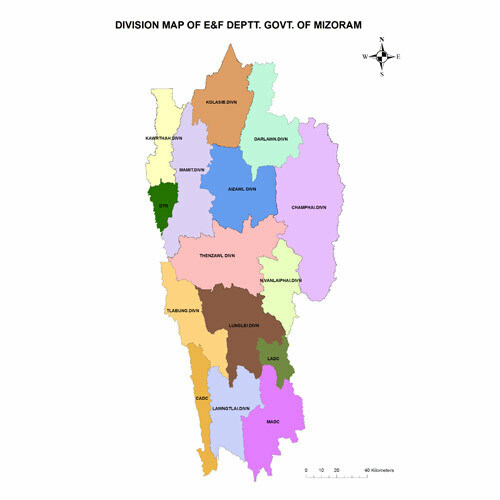 The relatively small state of Mizoram came into existence on Febuary 20, 1987. It was originally a part of Assam but it became a Union Territory in 1972, when the first assembly elections were conducted. The state government is the highest government body in Mizoram and the Chief Minister holds executive power. The Mizoram legislative assembly is unicameral, comprising 40 members, who are directly elected from single-seat constituencies every 5 years. Although a small state as compared to Delhi, Rajasthan and the others, there has been quite a bit of friction surrounding the State poll schedule this year. Various political parties, religious groups and NGOs had written to the Chief Electoral Officer, requesting him to reschedule the election and vote counting as the dates clashed with the annual gathering of the Presbyterians and Pentecostals, religious groups which form the largest denominations in the state. According to church leaders, about 6,000 people would be attending the gathering which would prevent them from casting their vote. After the CEO refused to entertain the request, six of the political parties wrote to the Election Commission of India (ECI), asking for the removal of the state CEO. The final decision of the ECI is yet to be announced. To read more on this, click here. Like all other Indian states, Mizoram too is afflicted with corruption at several levels. There are several delays and suspensions of government projects, which are clearly stall tactics and have received attention and huge criticism from people and various groups. The state is also in turmoil due to the problems caused by between different tribes and the as of now dominant Mizos calling the shots, while a few smaller tribes are marginalised and left without any power at all. The issue of development is quite important as the state is a small one and 70% of the people depend on agriculture as their main source of livelihood. The incumbent government states that it is trying to implement New Land Use Policy (NLUP) and various policies to develop both land and water routes for trade. It believes this will help accelerate development in the state and provide more employment opportunities. Mizoram is a state with a very high literacy rate, however strangely enough their employment rate is very low. The population of the state is quite impressive but the employment rate doesn't seem to be rising. The new government should try and create more employment opportunities to accommodate the bustling populace. Another major issue that the different parties will be addressing is that of Illegal immigration. The problem of illegal immigrants from neighbouring countries such as Nepal, Bangladesh and most notably Myanmar is expected to be a highlighted point brought up by the opposition parties. They will possibly use this point to question what four-time Chief Minister PU Lalthanhawla has been doing all this while. According to the New York-based Human Rights Watch, there are as many as 70,000 to 100,000 ethnic Chins from Myanmar in Mizoram, who fled to India in the last two decades to escape massive human rights abuse in western Myanmar. The report that 37,000 tribal refugees have returned from Tripura is yet another issue that will surely affect the result of the Assembly Elections. The tribal wars that have been going on for years now, have escalated. The tribal Reang refugees, had fled their homes in several villages in Mamit district in western Mizoram in October 1997 after ethnic clashes with the majority Mizos flared over the killing of a Mizo forest official. In Mizoram, the estimated population of Reang tribals has reached 100,000. Besides, there are many tribals living in the mountainous border state, whose total population is about one million. 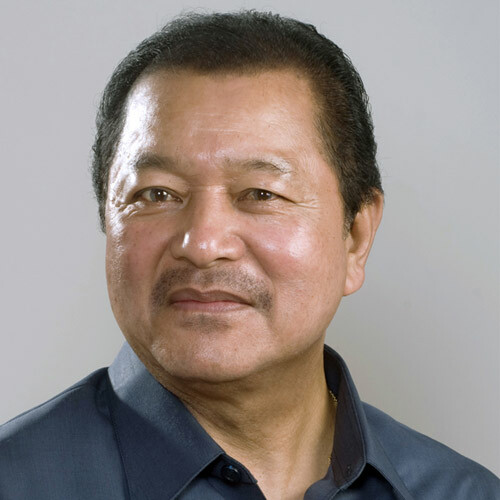 Lal Thanhawla has been the Chief Minister of Mizoram since December 11, 2008. He successfully contested the 2008 Mizoram Assembly Election in Serchhip and South Tuipui. His party, the Indian National Congress, resoundingly won that election with 32 MLAs. He is the son of Hmartawnphunga Sailo and Lalsawmliani Chawngthu. He completed his Matriculation in 1958, his Intermediate Arts in 1961 and his BA in 1964 Aizawl. He currently resides in Zarkawt Veng, Aizawl. Lal Thanhawla started his career as Recorder in the office of Inspector of Schools in the District Council. After that, he joined the Assam Co-operative Apex Bank as Assistant. In 1966, he joined the Mizo National Front as Secretary till 1967 when he joined the Indian National Congress party after he was released from jail in Silchar. In 1973 he was elected Party President. In 1978 and 1979 he was elected as a Legislator in Union Territory Elections. In 1984, under his Leadership, the Congress party swept the state and he became Chief Minister. In 1986, when the Peace accord was signed between India and MNF, he gave up his Chief Ministership as party of the agreement to Pu Laldenga. In the first State MLA elections of Mizoram in 1987 he was elected as Chief Minister and continued to serve as Chief Minister after being re-elected in the 1989 and 1993 Elections. He lost his MLA seat in 1998 but got it back in the 2003 elections. Currently he is elected from both Serchhip & South Tuipui Constituency. For more information on his Political Activities, family, past election experience and more; click on here. The Chief Minister, Mr. Lal Thanhawla said, "the present status of Sinlung Hills Development Council is sufficient" during the Assembly Session held on July 26 2011. Pu Zoramthanga, the former Chief Minister of Mizoram could prove to be the biggest hurdle to Cogress winning over Mizoram once again. His ten year term he served as Chief Minister may have gained him some political support that could help him in the upcoming election. He previously lost out to the Congress party in the 2008 Assembly elections. He is part of the Mizo National Front Party and had stated that his position as Chief Minister was the reason for his previous loss and resigned shortly thereafter. He contested both North and South Champhai but found himself defeated both times. He was part of the underground movement, The Mizo Freedom Movement in 1966. He then went on to serve as the secretary for Run Bung Area for three years and then went on to accept the post of secretary to the President, Pu Laldenga, a post he held for seven years. In 1979, He was given the responsibility of the Vice President. He was arrested by the army and held at the Assam Rifles Quarter Guard during the insurgency, due to which he is actively pushing the re-location of Assam Rifles outside the city of Aizawl. He was made a Minister in the interim government of the state. When Pu Laldenga formed the Mizo National Front, Zoramthanga worked on the Finance and Education departments. After Pu Laldenga's death in 1990, Zoramthanga rose to become the president of the party. He proved upto the challenge when he won the State Assembly Elections in both 1998 and 2003, becoming the fifth Chief Minister. However he lost out to Pu Lalthanhawla in the 2008 elections, losing both Champhai seats. The lists of all major political parties in Mizoram, who will contest in the Assembly polls in the state to be held on November 25, has been announced by Monday. 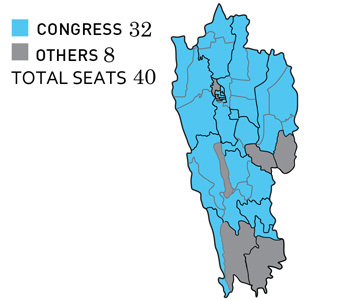 The Zoram Nationalist Party (ZNP), one of the significant oppositions in Mizoram, has decided to contest the elections alone, fielding contestants to 38 out of the 40 assembly constituency seats in the state. On the other hand, the main opposition party to the ruling Congress in the state, the Mizo National Front (MNF) has announced candidates to 31 assembly constituencies. The MNF said to reporters on Monday that it has come into a pre-poll alliance with other political parties like the Mizoram People’s Conference (MPC) and the Maraland Democratic Front (MDF), which have fielded candidates to 8 and 1 seats, respectively. The electoral banner under which the MNF, MPC and MDF have come together is the MDA. The Congress which released its list of candidates for the polls last week, has decided to contest the elections without any alliances. The BJP has announced candidates to 11 assembly constituencies. The ZNP Chief and ex-IPS officer Lalduhoma will contest from two seats, his home turf, Aiwal West-I seat and the Kolasib constituency. The chief opponent to CM Lal Thanhawla of the Congress, C Lalramzauva of the MNF and P B Lalsawmliana of the ZNP will contest from the Serchhip constituency. 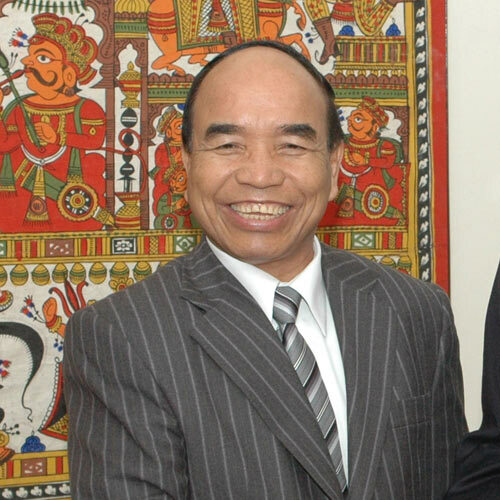 Former chief minister Zoramthanga of the MNF, will contest from the East Tuipui constituency in the Mizoram-Myanmar border, contesting against T Sangkunga of the Congress and W Chhuanawma of the ZNP. Here is the complete list of BJP candidates that was announced on Thursday, 31 October 2013. Announcement of BJP candidates for Madhya Pradesh & Mizoram assembly elections: Shri Ananth Kumar, an influential leader of the Bharatiya Janata Party (BJP) in Karnataka. Here is the complete list of Congress candidates. Lalthanhawla led the Congress to victory in the 2008 State Assembly Elections by beating out the ruling Mizo National Front (MNF). National parties like the BJP (Bharatiya Janata Party), the INC (Indian National Congress), NCP (Nationalist Congress Party), state parties such as MNF (Mizo National Front), MPC (Mizoram People's Conference), ZNP (Zoram Nationalist Party) and other parties like JD(U) (Janata Dal (United)); registered (unrecognised) parties like the LB (Lok Bharati), the LJP (Lok Jan Shakti Party), the MDF (Maraland Democratic Front); and other independents also submitted their nomination papers.The Congress won 32 seats of the 40-member assembly, while the MNF could manage to win only three seats, and the third side in the race, MPC and ZNP, only two seats each. Lalthanhawla was sworn in as the sixth chief minister of the state. He achieved a first for the state by becoming the first chief minister to secure the seat four times. There were 6,11,618 electors, and the total turnout was 80.02%. 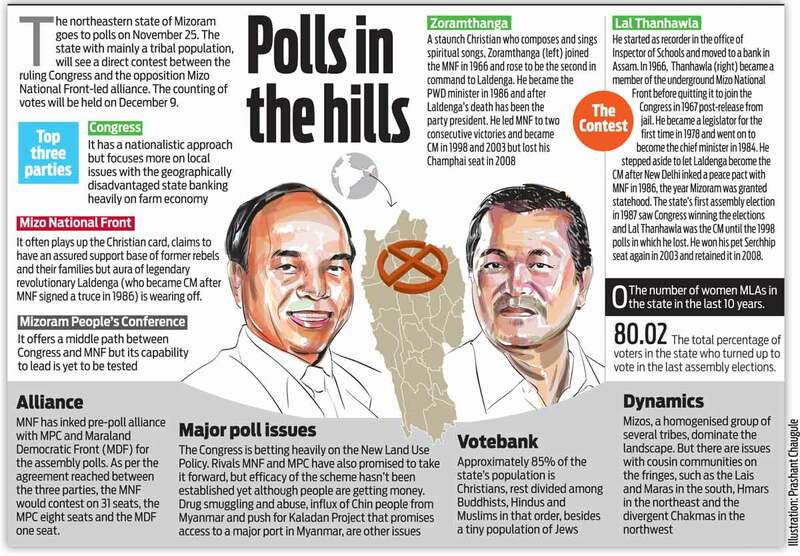 Lalthanhawla was almost written off when he made a dramatic comeback in Mizoram State Assembly by winning 32 of the 40 seats. Read more.